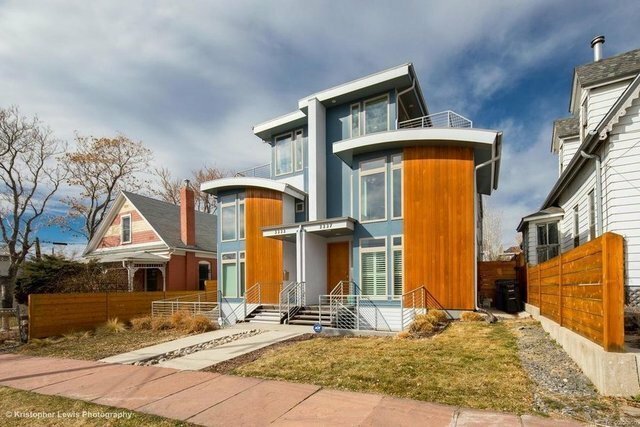 Stunning contemporary home in popular LoHi. A friendly neighborhood feel, while just a few blocks from Denver's top rated eateries such as Linger, Avanti, Old Major, & Root Down. Easily walk, bike, or scoot to LoDo, Coors Field, Pepsi Center, or Broncos Stadium. This light-filled unit lives large w a flexible floor plan. A 2-story LR shares a gas fireplace w the DR open to the kitchen & great room. A chef's kitchen has a Quartz island, Thermador cook-top, microwave & oven, & pantry. A private guest BR w 3/4 bath completes the main level. The Master suite, two additional bedrooms, Jack n Jill bath, a loft overlooking the LR, and laundry are on the second level. Many nice features: 3rd level flex space w access to expansive roof deck, hot tub ready and great city views; White oak floors; open staircase; Walk-out basement w guest entrance, 5th bedroom, theatre, bar, huge storage area; Nest thermostats; Prep'd for security; Wired for CAT5 & Audio; plantation shutters; spacious fenced yard!